The announcement from the Prime Minister and her partner, Clarke Gayford, that their team was expanding from two to three was a delightful moment not just for them of course but for the entire nation. In her first statement on the big news Prime Minister Ardern referred to the virtual village that their wee child would be born into. The Maori child is not to be viewed in isolation, or even as part of nuclear family, but as a member of a wider kin group or hapu community that has traditionally exercised responsibility for the child’s care and placement. The technique, in the Committee’s opinion, must be to reaffirm the hapu bonds and capitalise on the traditional strengths of the wider group. We share with all New Zealanders the joy that was radiating from the excitement of the Prime Minister in announcing this news today. This is the ultimate expression of Whānau Ora – the pathway for generations to follow – amongst the village of care that every child is entitled to be nurtured in. The taonga / sculptures in the photos are above stand guard at either entrance to Takahanga Marae in Kaikoura. I travelled there this week, on the most beautifully sunny day, for an update in the Social Recovery space. I was proud to share some of the results from our collaboration with He Toki ki te Rika in the employment sector. He Toki Step-up to work was initiated as part of the response to the Kaikōura Earthquakes. A number of organisations were assisting the community to rebuild, refocus and create opportunities for their community. Whānau members became unemployed as previous industries such as fishing, tourism and hospitality and many more became temporally redundant. Kaikōura whānau have always been resilient and innovative so were quick to adapt to the new employment opportunities in civil construction. Since April 10th 28 trainees, 14 Kaikōura and 12 Christchurch have completed He Toki Civil training. In the current social media noise around the value of te reo Māori, we’d love to encourage all our whānau to share their good te reo stories. Te Ataarangi Trust in the top of the South has made available an initial package of their Kāinga Kōrerorero resources to support us whānau at Te Awhina Marae; Collingwood Area School and Waikawa Marae where whanau are working on scheduling some initial Wananga Reo-a-Whanau . The strength of this initiative is that it is customised to whanau needs and aspirations. Kaiako have reported that whānau are embracing this programme and having fun. Whānau have set realistic goals for themselves and are committed to achieving them.. Some whānau have also planned how they will celebrate their successes and discussed with their mentor what success will look like, for example: “when I can take some of the labels off my kitchen because I know these kupu” “When we can kōrero in Te reo Māori for 20 minutes.” Korero mai – let’s keep the stories flowing. Big Tree Art is the aspiration of Hayden Parata-Ryland a young talented artist who wants to establish a pop up container studio/gallery for himself and other young artists. The intention of the studio/gallery is to display their art and services to a wide ranging client base. Hayden has a long-standing relationship with Te Āwhina Marae and has worked closely with Tohunga Whakairo Matua John Mutu. 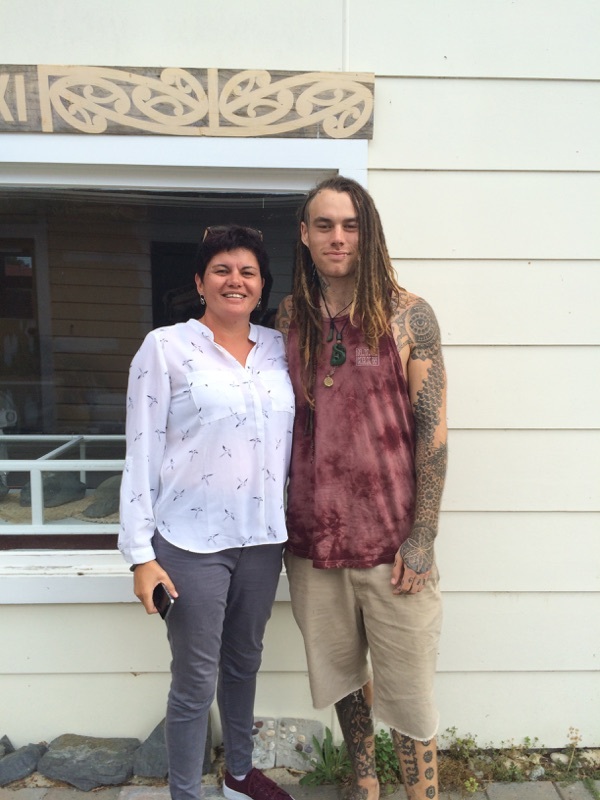 Hayden has a long term goal to provide Māori art wānanga and tutoring for young artists. Te Pūtahitanga o Te Waipounamu has contracted Te Āwhina Marae Incorporated who will contract through a Memorandum of Understanding with Hayden Parata-Ryland from Biig Tree Art. We look forward to seeing the results of this collaboration! Post the 14 November 2016 Earthquakes, Ricky and Savannah Māua have developed a firewood business in Seddon. In developing this business and exploring other opportunities they aim to increase their whānau income and reduce their support from MSD. Their whānau all work together in the enterprise to make an income. Ricky works full-time in the business. His job will be to source and collect firewood, split the wood, source dry wood, organise where the wood is stacked, make sure the wood is secure and collect and keep wood to dry for next season. The whole whānau is involved in running and helping to grow the business. Although their tamariki are young, they help load up the firewood in their vehicle. Their tamariki also help to deliver firewood and talk to customers. Their tamariki are good little workers and love to help. Savannah will take care of all administration and accounts side to the business. They also want to learn and apply efficient and effective ways to administer the business. Ricky and Savannah Māua will develop their firewood service by offering a pensioners pack so kaumātua and kuia don’t have to chop their wood or rely on others to do this for them. They see the firewood side of their business as the stepping stone to develop a garden maintenance business. It is truly heartening to see a whānau take their destiny into their own hands like Ricky and Savannah and we wish them well. The Maua whanau complete with Crinkles the dog! While visiting Kaikoura this week, it was great to see some of these real-life posters demonstrating the different reactions amongst the community, post the earthquakes and in the weeks and months since. Last year’s 7.8 Kaikoura earthquake not only shattered the environment, but the lives of many whanau and families in the Marlborough region, particularly between Clarence to Seddon. In the hours, weeks and months following the quake, teams of people from emergency and social services stepped up to respond to needs of their communities. As mana whenua, Public Health Service health promoter Arthur Phillips quickly realised the implications of the earthquake. Within a few days he joined a Maori team alongside Shane Graham (Te Puni Kokiri, Kai Tohu Tomua), Barney Thomas (Department of Conservation, Pou Tairangahau) and Te Ra Morris (Te Putahitanga o Te Waipounamu contracts advisor) which helped run the Marlborough civil emergency centre. Arthur says quite early on the team realised the reports from the emergency response agencies were not quite matching the picture they were getting from their contacts in the Seddon and Ward communities. how many Maori there were in the area. “The earthquake hit at shearing time and fishing and farming was in full swing,” he says. “Many Maori in the area involved in these industries are maata waka as they have moved to the region from other parts of New Zealand – we found 69 whanau we didn’t know about.” Over the following months the Maori team worked alongside the communities to ensure whanau and families received appropriate support. This included working out the best way to deliver goods, emergency packs and care boxes, helping to organise a Matariki celebratory hangi for Ward Maori and wider community, assisting with funding applications and generally helping family and whanau settle in to their postquake ‘new normal’. Arthur says there were many lessons learned out in the field and these have informed new emergency response planning underway. Arthur endorses the adoption of the principles of kotahitanga (unity), aroha ki te tangata (love and support to others), manaakitanga (care of others) and kaitiakitanga (guardianship) during any emergency response. In the hours, weeks and months following the quake, teams of people from emergency and social services stepped up to respond to needs of their communities. Ngati Toa rangatahi put together 270 emergency back packs to give out to Maori whanau and kaumatua in affected areas. Te Pūtahitanga o Te Waipounamu was pleased to be able to sponsor whānau to put together these vital backpacks. Finally, some beautiful shots from Wharekauri/Rekohu/Chathams Islands when Maania went on behalf of Te Pūtahitanga o Te Waipounamu to the Stakeholder meeting at the end of last year. Te Ha o te Ora o Wharekauri has received some support from Wave Seven funding to host a Chatham Islands Symposium addressing health, suicide and alcohol and other drugs; but also to do a stocktake on all the services and supports that are on the island – or should be on the island. Share your ideas with us!